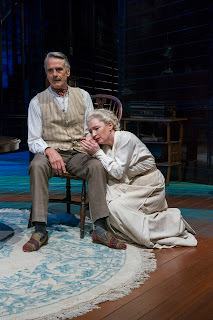 Like an immense series of interlocking puzzle pieces, Eugene O'Neill's Long Day's Journey Into Night inexorably charts the downfall of a family which has literally collapsed in upon itself through decades of inner rot. The current production at the Brooklyn Academy of Music, and originally seen at the Bristol Old Vic, offering quite the spellbinding journey. The story takes place over the course of a single day at the Connecticut home of the Tyrone family during the summer of 1912. Stage actor James Tyrone (Jeremy Irons) and his wife Mary (Lesley Manville) following their annual pattern of hunkering down for a brief respite after yet another season on the road. A life, as Mary often notes, of endless “cheap hotels”. Mary also forced to deal with continual bouts of terrible loneliness during the periods James is busy performing or out with his fellow thespians. Joining James and Mary in Connecticut this year are their two adult sons. James Tyrone Jr. (Rory Keenan), a.k.a. "Jamie", an actor in his own right, as well as a drunk and a woman chaser; and Edmund (Matthew Beard). The baby of the family, and Mary's favorite, Edmund has recently returned home after working his way across the globe by ship, and recently embarked on a writing career. Edmund, whose health has never been the best, may also be suffering from consumption, a condition that killed Mary's father years earlier. Mary is also heavily addicted to morphine. A condition she developed due to complications in the aftermath of a very difficult pregnancy. James not helping the situation by refusing to take his wife to a more competent (and thus more expensive) physician; rather than the one he ultimately selected. As quickly becomes apparent, James is a notorious tightwad due to a continual fear of poverty, one stemming from childhood. This is also why James is continually conned into buying worthless parcels of land. He feeling that land, which will always be there, is a much safer investment than stocks and bonds, or putting his money into banks, all of which can fail. Despite the family's hope they might be able to enjoy their time together this summer, every one of the four is on edge. Mary has just returned from her latest stay at the sanitarium, with the men constantly observing and dissecting her every movement, looking for signs she has returned to the needle. This constant scrutiny causing Mary to feel something akin to a fly under a microscope and only serving to add to the emotional pressure she feels as she struggles to stay clean. A major irony in the story is how James believes all that’s needed to break any cycle of addition, is one's own will power. Yet James himself is unable to walk away from his refusal to spend one penny more than necessary, for anything. Be it not getting the best help possible for Mary, or later Edmund, or not wanting more than one light bulb to burn downstairs in their home at night. His irrationality over money coloring everything he has done in life. Long Day’s Journey Into Night could be called O’Neill’s very personal requiem. A semi-autobiographical story, the play was completed in 1941, yet not published until 1953, three years after his death. What makes the story so compelling is that O’Neill takes the time to thoroughly examine the roots of each of the four main characters, while also showing the circumstances which have brought them to where they are today. Not to mention also bringing forth the self-destructive streak in each. From James' harrowing experiences as a child, to why Mary both loves and hates each of her children, (albeit for different reasons), the text never stops at the surface of any issue discussed. Particularly resonating in this regard is Jamie’s drunken warning to Edmund about how he will do his best to destroy his younger brother, in spite of how much he loves him. Irons is perfect as James. The character continually projecting an attitude of superiority, coupled with a frequent sneer of disgust. Also part of his makeup is an air of terrible resignation regarding events of which he is helpless to do anything about. At times, James does half-heartedly acknowledge his own shortcomings, but, like everyone else in this family, is either unable or unwilling to save himself from what he has become. Manville gives an absolutely dynamic performance as Mary. A woman walking the finest of lines, she desperately wants to be cured from the poison that rules her soul, but her life has become so full of painful memories, that existing in a drug-induced haze continually looks more and more attractive to her. While Manville shows Mary to be quite the pitiful figure, she also brings forth the character's deeper feelings of bitterness in regards to all she has suffered over the years. Each member of her family, at least in Mary's eyes, partially to blame for the way she is now. Keenan is good as Jamie, a young reprobate already well on the road to ruin. Though underneath his anger is a desperate need for someone to show him that life doesn’t have to be this way. It's also interesting to note that while Jamie hates his father with a passion - the feeling often mutual - in actuality, he is more like his namesake than he's willing to admit. Beard is fine as Edmund. A stand-in for O’Neill, and a bit of a dreamer, he wants nothing more than to simply get well. However, upon his return home, he too becomes enmeshed in the family dynamics once again, receiving mixed signals of love, hate and disgust from all sides. He also doesn’t make it easy on himself by succumbing to temptation a little too regularly. Such as continually drinking alcoholic beverages when it’s clearly not good for his health. Jessica Regan does well as the family serving maid Cathleen. She nicely playing off Manville in their scenes together. Direction by Richard Eyre is very strong, allowing the story to move at its own pace as, bit by bit, the truth about what the audience is seeing moves front and center. Eyre also does a nice job in seamlessly melding the nostalgic and occasional comedic moments with the more dramatic ones. The set by Rob Howell is nicely eclectic, showing pretty much what an actor of James Tyrone's ilk would have in his home. Though some parts of the house seem a bit too modern, or fit the era depicted. Peter Mumford's lighting is very good, especially in the final act. John Leonard's sound design also adds an important element to the tale. It nicely calling up the sounds of the wind and sea birds to help place the story properly. There are, however some problems in being able to hear the cast in act one, along with the habit the actors had of stepping on each other’s lines more than once. Offering an unflinching look at one family's ultimate "heart of darkness", this production of Long Day's Journey Into Night, other than a few small issues here and there, is quite the wonder to behold.